This map depicts the sage-grouse range in Oregon and Priority Areas for Conservation for sage-grouse. Map courtesy of The Nature Conservancy, 2014. 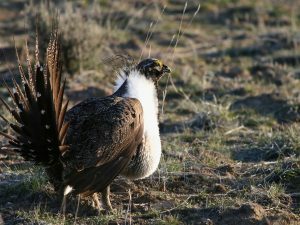 With the September 30th listing decision deadline approaching, 11 western states, including Oregon, are sharing hope that upfront investments to protect sage-grouse will mean sagebrush ecosystems are on the path to recovery, and the bird no longer meets the criteria to be listed as threatened or endangered. In Oregon, those investments are part of a broader Sage Grouse Conservation Action Plan that was adopted by Governor Kate Brown in an executive order signed on September 16. 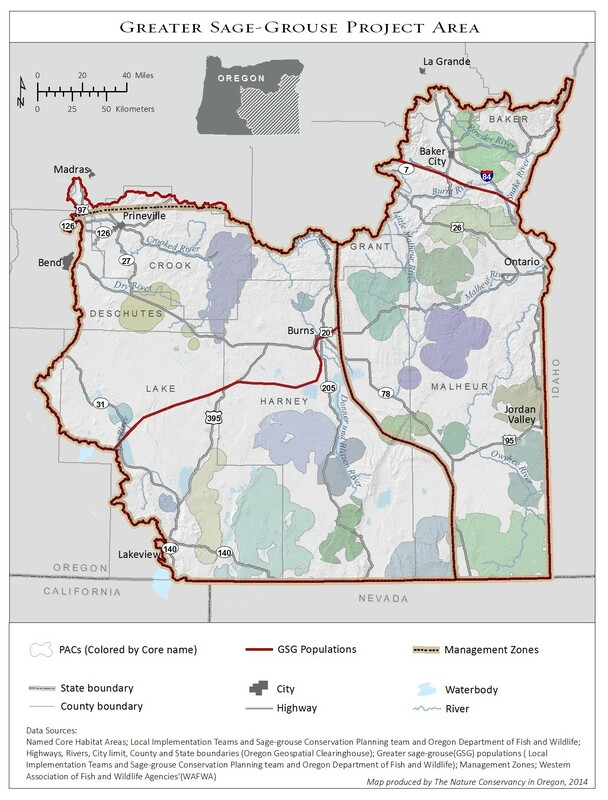 The plan is centered on balancing conservation of prime sage-grouse habitat with the long-term economic and social health of communities in central and eastern Oregon. This is because sagebrush country in central and eastern Oregon is home to both sage-grouse and close-knit rural communities with an economy centered on agriculture and natural resources as well as emerging industries in mining and renewable energy. Oregon’s actions have been strategically crafted under an “all lands, all threats” approach led by the Sage Grouse Conservation Partnership to address multiple threats within multiple jurisdictions. “All lands” are addressed by coordinating federal, state, local, and private sage-grouse conservation efforts in Oregon that meet US Fish and Wildlife Service requirements. 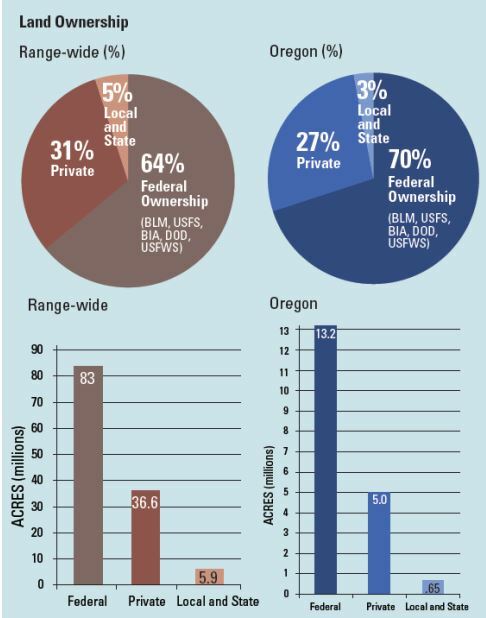 Engaging all parties with ownership in the sage-grouse range is important given that 64% of the range is under federal ownership (mostly by the Bureau of Land Management [BLM]), 31% is under private ownership, and 5% is under local and state ownership. “All threats” are addressed by identifying a broad diversity of new and existing strategies to promote viable sage-grouse populations. 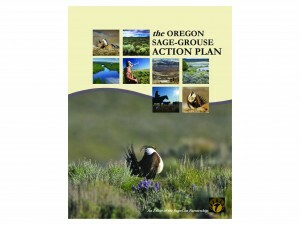 What makes the “all lands, all threats” strategy work is the unprecedented collaboration among private and public stakeholders including the BLM, Natural Resources Conservation Services, Oregon Department of Fish and Wildlife, other state agencies, counties, landowners and managers, and conservation interests. Most of the land in the sage-grouse range is under federal ownership, followed by private ownership and local and state ownership. It is important that all landowners are in engaged in the conservation of sage-grouse. To gain an appreciation of how this approach suits the situation in Oregon, it is important to acknowledge the drivers behind sage-grouse decline in the state. In general, sage-grouse decline stems from habitat loss and fragmentation, which results both from human-caused drivers like development and “natural” threats like wildfire. 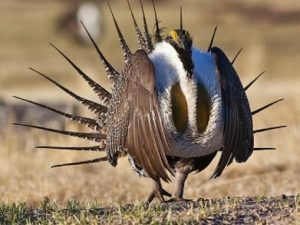 In some states in the sage-grouse range, direct conflict between resource extraction and development is a more significant cause of the bird’s decline. This is not really the case in Oregon. While development has played a role in sage-grouse decline in Oregon, the primary culprit is large-scale ecological changes resulting from the combination of wildfire, the spread of exotic grasses, and the expansion of native junipers. To complicate these matters, these changes vary in importance along an elevational gradient. In lower elevations, large fires have burned through millions of acres of sage-grouse habitat, fueled in part by the spread of cheatgrass and other invasive, non-native weeds. In mid- to upper elevations, less frequent fire has actually led to juniper encroachment, reducing the availability of suitable sage-grouse habitat. Junipers tends to choke out sagebrush and other plants that sage-grouse depend on, and areas with even relatively low levels of juniper are avoided by sage-grouse because they can serve as potential perching spots for predators. These complex interactions of threats cannot easily nor readily be managed through regulatory means and require a larger, coordinated and proactive effort. Secondary, but still important, threats to sage-grouse in Oregon include disturbance from infrastructure (i.e. fences, roads, and electrical lines) and associated noise that leads to increased predation of sage-grouse or avoidance of previously occupied habitat altogether. These threats are more responsive to regulatory solutions, and Oregon has worked hard to combine new and existing policies to effectively steer development away from the most important sage-grouse habitat, while providing the flexibility needed to allow for unavoidable impacts. Despite their heavy bodies, sage-grouse are strong fliers with recorded speeds reaching almost 50mph and single flights as long as 6 miles. Human disturbances such as fences or poles have been associated with mortality of these birds due to collisions. Photo courtesy of USFWS Mountain Prairie. The “all lands, all threats” approach developed fits the complex situation in Oregon because it centers on “Priority Areas for Conservation” or PACs that contain large and intact sagebrush landscapes and about 90% of the breeding populations of sage-grouse in Oregon. PACs cover about 38% of the species range, which points to management flexibility outside of these priority areas. Prioritization of these core areas will allow land use planners and managers to direct development away from these sensitive areas. It also provides an opportunity for strategic conservation actions such as restoration to maintain connectivity of sage-grouse habitat to prevent further habitat fragmentation in and around PACs. Sage-grouse is an iconic species in its own right, but the fate of sage-grouse also points to the question of the future of the sagebrush ecosystem in central and eastern Oregon, where species like elk, grouse, shorebirds, salmon and kit fox are interwoven with cattle and sheep. 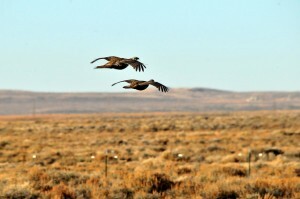 Sage-grouse are often referred to the “canary in the coal mine” for sagebrush. Oregon’s proactive approach and plan to preserve an iconic landscape and the human communities and economic systems that depend on it will weigh heavily in the ultimate decision of an ESA listing. Stay tuned for more coverage on what the listing decision will mean for Oregon. 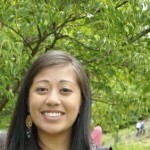 June Reyes provides communication and research support to Willamette Partnership staff. June previously worked with commercial facilities on stormwater management and has experience working on conservation programs in Southeast Asia. In her spare time, she enjoys cheering on the Lakers and spending time in the ocean.